Cherries Are In–And Almost Gone! If you’re interested in healthful, seasonal and local eating, thinking ahead is a trait to nurture, assuming you’d also like to eat well from November to March. Those are pretty dismal months, unless you think ahead and start putting food away in the summer months as it comes into season. 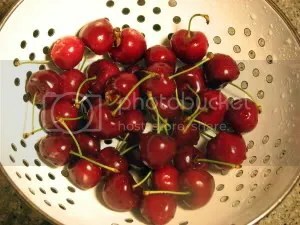 Stem, then Wash If possible, wash cherries an hour or two in advance so they can dry before putting in the freezer. The less water on them, the better. 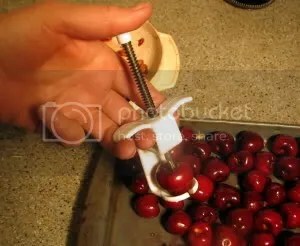 Pit It’s time-consuming, but pitting is an investment you will so appreciate when you pull out the frozen cherries to use. Plus, you can sit outside on a gorgeous summer night and enjoy the sunset as you pit. Invite a friend over for more fun. Note the small, low-tech and equally low-cost pitter I'm using. I've found the fancier, supposedly faster, and definitely more expensive models don't work nearly as well. Pop in the freezer for a day or two, until rock hard. The advantage of pre-freezing fruits individually is that you’ll be able to scoop out small amounts at a time (or just a couple to pop into your mouth as a treat.) Otherwise, the fruit freezes into a large glob. Apricots can be frozen in the same way. Just slice into halves, remove the pits and lay, skin side down on cookie sheets to freeze. But their season is equally short, so hurry. 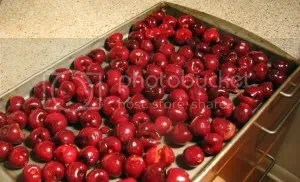 Pre-freeze cherries individually on a cookie sheet before bagging, then you'll be able to take them out by handfuls. What to do with frozen cherries? There are the usual fruit desserts: pies, cobblers, crisps, etc. Of course they are also great in breakfast dishes (slow cooker oatmeal, smoothies, on top of granola and yogurt, etc.) Now I’ve begun experimenting with them in salads (in the middle of winter when it’s financial idiocy to spend money on tomatoes), in sauces (for meats and poultry) and in salad dressings and other savory dishes. Want the recipe for Thai Kale Salad with Cherries and Coconut? It’s a dish we prepared at our Farmers Market to rave reviews. Leave a comment and we’ll send you a .pdf. Anxious to try the recipe. Plan to freeze cherries for the first time. Thanks for the tip. Are these tart cherries you’re talking about, or sweet (“bing”) cherries? Although the pictured cherries are sweet bings, you can do the same thing with sour cherries. I also love to dry sour cherries in a counter top dehydrator for use all winter: stuffed in squash, sprinkled on salads with feta cheese, perking up braised carrots, etc.